In the South-Eastern corner of Botswana lies the impressive Tuli Game Reserve. Historic Baobab trees featuring carvings of famous early explorers rise majestically along ridges overlooking valleys of Nyala trees and Jackalberries dominating the landscape. 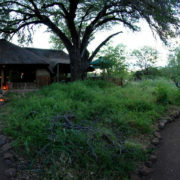 Walked by enormous herds of African Elephant and home to a significant paleontological history, Tuli offers the unusual blend of ease of access with true wilderness. 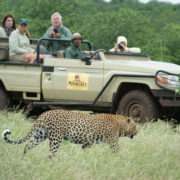 There are a range of safari activities available in this historic reserve, with the top attractions including wilderness walks, cycling and the ever-popular photographic hides offering unbeatable photographic opportunities. Tuli is blessed with an excellent predator density and superb elephant sightings, although no buffalo or rhino occur here anymore. The birding in the denser riverine habitats is impressive, as the great Limpopo river provides a boundary to part of the reserve. The Tuli area also offers an interesting insight into early African civilisations as well as the more recent colonial history of frontiersmen, ensuring that never a dull moment is to be had in this special corner of Southern Africa.